Welcome to the 4th Battalion Northumberland Fusiliers website! The 4th Battalion (Bn) came into being as a result of the Army reforms of 1908, when 'Volunteer' and Yeomanry Bns were combined to form a new organisation called the Territorial Force. Battalion Headquarters were established in Hexham and detachments were formed along Tynedale at Bellingham, Corbridge, Haltwhistle, Hayden Bridge, Newburn and Prudhoe. The 4th Bn was one of four Northumberland Fusilier Territorial Bns, all of whom were mobilised when war broke out on the 4th of August 1914. The following day, 17 officers and 660 men from the 4th Bn reported to the war station and embarked on a period of intensive training in Newcastle and later the Blyth area. The 4th Bn sailed for France, as an integral part of the Northumbrian (Territorial) Division, on the 20th of April 1915. Within a week the 4th Bn was committed to action in the Ypres Salient, suffering heavy casualties in an assault on the German front line during the Battle of St Julien. Over the next three years the Bn fought in most of the British sectors on the Western Front including the Somme, Passchendaele, Arras, the Lys and Aisne. Casualties were typically heavy, with more than 770 fusiliers killed and 2000 wounded, necessitating hundreds of men to be recruited and drafted, primarily from Tynedale during the early months of the war, but eventually from all over the United Kingdom. The 4th Bn virtually ceased to exist after the Battle of the Aisne (27 May 1918), because so many fusiliers were killed, wounded or captured. I have been researching the 4th (Territorial) Battalion of the Northumberland Fusiliers, for the period 1908 to 1919, for a few years now. It began as a family history project, to determine what happened to my Great Grandfather during the 1st World War. However, the lengths to which I had to go in order to reconstruct his short military career, convinced me of the need for a written account of the 4th battalions' exploits. The research also equipped me with much of the material with which to write such an account and to compile a database of all those who served with the battalion. Needless to say my family history project has not resurfaced! * More than 6000 fusiliers, 2500 of whom definitely served with the 4th Battalion (Bn) NF between 1908 and 1919. * The day to day location and actions of the 4th Bn throughout the 1st World War. This website was originally launched in December 2003; has now attracted more than 90,000 visitors and received a major upgrade in 2016. To collate data information on the 4th Battalion Northumberland Fusiliers and its personnel in order to provide an accurate and detailed account of its exploits during World War One. This data, which I am sure will be of interest to local and family historians, has been collated from a wide variety of published and archived material, including unit and personal war diaries, newspaper articles, medal rolls and relatives. However, there are periods of the Great War where there is very little recorded on the 4th Bn and its activities. Therefore, the narrative, database and web pages could be significantly enhanced by data from original material such as fusiliers' diaries, letters, photographs and army papers. If you possess such items and are willing to loan the originals or donate copies to me then I would be very pleased to hear from you. All items will be treated with the utmost respect and returned as quickly as possible. If you possess, or would like, information on a relative or family friend, who you believe served with the battalion during this period, again I would be very pleased to hear from you. * The Northumbrian Territorial Division (Referred to as the 50th Division by mid-1916). * The three territorial infantry brigades of the Northumberland Division. Known as the Northumberland, York & Durham and Durham Light Infantry Brigades. (Referred to as the 149th, 150th and 151st Infantry Battalions by mid-1916). * The territorial battalions of the Northumberland Brigade: Known as the 4th, 5th, 6th and 7th battalions. * The Companies of the 4th Battalion: The Bellingham, Corbridge, Haltwhistle, Hayden Bridge, Hexham, Newburn and two Prudhoe companies (coys). Otherwise known as: 'A' Coy, 'B' Coy, 'C' Coy, 'D' Coy, 'E' Coy, 'F' Coy, 'G' Coy and 'H' Coy. * The sectors of the Western Front on which the 4th Bn served, including the Ypres Salient, Armentieres, Somme, Arras, The Lys and the Aisne. * The battles the 4th Bn took participated in, including: St Julien, Flers-Courcellette, 2nd Passchendaele, Rosieres, Estaires, St Quentin and the Somme Crossings. * The Officers and men of the 4th (Service and Reserve), 1/4th, 2/4th and 3/4th Battalions NF. * The memorials and cemeteries where fusiliers of the 4th Bn are commemorated, including the Menin Gate, Thiepval, Tyne Cot, Soissons and Hexham. * The activities undertaken by the population of Tynedale (Home Front) to support the 4th Battalion and the war effort in general. 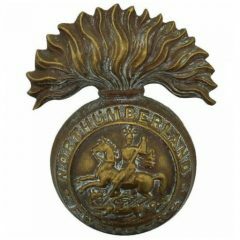 If you are searching for information on an individual who served in the Northumberland Fusiliers (NF) during the First World War and the information provided on this website does not appear to fit what you already know, you should bear in mind that the NF Regiment had raised more than fifty Battalions by 1918. This website is devoted to just one of those Battalions. Select the NF Regiment link for a brief description of the other NF battalions and a list of websites that will provide more information on them. The information provided on this website is the result of countless hours of painstaking research principally conducted at the National Archives - Public Records Office, British Library - Newspaper Library and the Northumberland Fusiliers Museum. I have taken particular care to ensure all the information presented (published and unpublished works) has been correctly referenced and the authors acknowledged. Be courteous, request permission to use the information and acknowledge the source. If you find this website of interest, or benefit from a database search, please consider making a donation to offset the cost of running the site.